letsenhance.io is a free online service which uses state of art neural networks and Machine Learning to remove JPEG artifacts, upscale the image 4 times and all along preserving the quality. 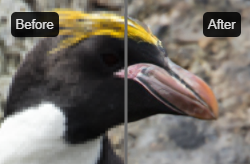 Fix the JPEG: All blocky noise is detected and removed automatically from JPEG images. Upscale 4x: Boost resolution 4x times, keep edges and features sharp and crisp. Add missing details: Neural network hallucinates missing details to make image look natural.